Custom MMIC has introduced two new GaAs High IP3 I/Q Mixer MMICs covering the C and X-Band. The CMD257C4 and CMD258C4 feature wide IF bandwidths and excellent image rejection in compact 4x4 SMT packages and offer cost savings compared to hybrid image reject mixers and single sideband up-converter assemblies. 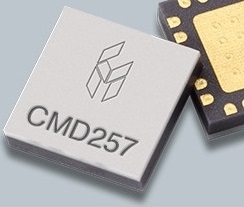 The CMD257C4 offers a wide IF bandwidth from DC to 3.5 GHz, and an RF & LO bandwidth from 6 GHz to 10 GHz. It features excellent image rejection of 31 dB, and has a low conversion loss of 5.2 dB. The CMD258C4 also delivers excellent image rejection of 29 dB, and a low conversion loss of 5.5 dB. It’s RF & LO range also covers C-band and X-band frequencies, from 7.5 GHz to 13 GHz, with a wide IF bandwidth of DC to 3.5 GHz. Both, the CMD257C4 and CMD258C4, can be used as either image reject mixers or single sideband up-converters, and are composed of two double balanced mixer cells and a 90 degree hybrid. An external IF hybrid is needed to complete the image rejection. These MMIC mixers come in leadless surface mount packages, and are designed to operate within specification from -40 ℃ to 85 ℃.